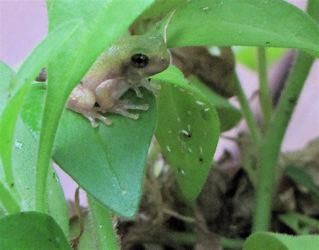 A couple days after posting my 9/15 newsletter, I noticed one of the frogs had back legs. What a day of rejoicing that was! The progress was now showing the it's been wonderful to watch the progression and to release them one by one. We have even seen one of them since the release which is very special. I wondered if they would come back. They must know my voice and face like our resident Gray Tree Frog, the male who fathered this babies. They are so cute when they all come to the top to watch me put food in (video link of this below). Those big eyes and the tiny mouth that blows bubbles. Priceless! Guess that's why my husband calls me "Mama Tad" these days. View video and photo album and/or Read the whole story with the final update. We had a beautiful Harvest Moon on September 23rd. Such events really make you think about how large the entire universe is. It redefines the word 'amazing' when you think how big the God is that made it. We've been having a lot of new and familiar critters visiting at our home we call Bluebird Cove, so if you've not been to the Bluebird Cove Critters 2010 album for awhile, drop by for a visit. The Butterfly Bench has a new color. Remember if you're going to be in the Central Virginia area, I'd love to see you for tea! Get outside and enjoy this Autumn weather!